Customers are reporting significant annual savings. With Orange EV electric trucks, fleets avoid the higher total cost to purchase and operate diesel trucks. Save up to 90% net in fuel, 100% on engine and transmission-related powertrain maintenance, and an estimated 95% on brake maintenance. 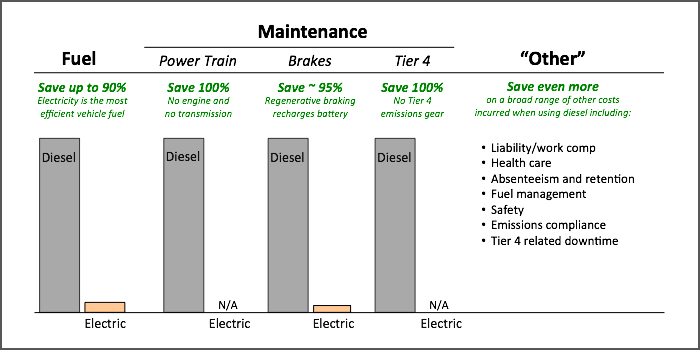 By eliminating diesel, save even more on fuel management, shrinkage, compliance, liability and work comp, health care, safety incidents, Tier 4 emission system related costs, and more. Orange EV’s systems are more than 400% more energy efficient than traditional diesel systems. Diesel engines consume vast amounts of costly diesel fuel where Orange EV trucks use less expensive, price-stable electricity. To meet emissions standards, diesels have become increasingly complex, problematic, and costly. Orange EV’s powertrain has far fewer parts than diesels and is largely maintenance-free. This means less wear and tear, which reduces maintenance, repair, and downtime. On average, Orange EV electric trucks require < $1,000 in preventative maintenance per 3,000 hours of operation. Every site is different based on fuel price, labor rate, trucks usage, etc., but they all have one thing in common: the higher the engine hours, the greater the savings. Diesel truck operating costs are driven by how much the engine works and amount of fuel consumed. When diesels are replaced with electric, diesel fuel costs are eliminated. Cost parity is now a reality. Because total cost of ownership (TCO) is often less than for a diesel, fleets can deploy Orange EV’s electric trucks using existing capital and expense budgets. With financial incentives, however, fleets can renew fleet assets and minimize annual operating costs with reduced capital investment. Traditional equipment financing is available.